I am terribly fascinated by underground exploration. Like natural caves, or the artificial tunnels and lost places under our cities. Exploring such things vicariously suits me just fine, so I'm glad there are folks who have the guts to crawl around in dangerous underground cavities. There are many sites for these activites. I mention some here. One I just ran into via wood s lot is Sleepy City, which has amazing pictures. Sleepy City is a photography site dedicated to the secrets of the city... your city. 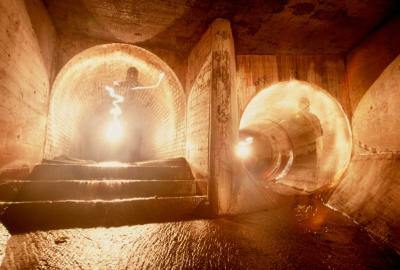 Underground tunnels, derelict industrial components and urban ruins are where I like to play. Discarded by society these interesting and historical sites wait quietly for the occasional urban explorer. Grab a torch and have a wander. Lots of photos. And beautiful words too. The city sprawls in all directions, a hectic mass infecting the earth it rests on. The buildings reach upwards and the root like tunnels burrow below. Citizens run madly, never considering the back alleys, tunnels and buildings of yesteryear. However these are places that, if you recognise them, hide the history and secrets of your city. Through the decaying doorframe or that unnoticed metal hole wait adventure and sights few will ever see. All it takes to step across into this parallel world is a torch and a curious spirit. No joining fees, no ridiculous contracts and nobody looking over your shoulder. You might be surprised how little of your city you have ever appreciated. Oh, and here's an interview at Creativity/Machine with the "mysterious urban explorer" behind Sleepy City. 1 Jul 2004 @ 18:26 by Quirkeboy @209.92.185.201 : Fantastic.. Thanks for the link.. I cant believe the beautiful lighting he (or she?) was able to create by painting with the light.. very stark and brooding.. Reminds me of my final photography assignment in college.. I snuck into a network of railroad buildings that have been closed down for decades..
Theres something beautiful and depressing about abandoned labryinthean industrial buildings.. Why is that?? It seems contrary to my tastes.. It was like there was ghosts and energy lurking in every corner. Every photo I took I couldnt help but think about all those men who spent their best years toiling in these buildings.. and to what end?? The buildings are overgrown with ivy and have been emptied and looted and have layers of graffiti.. makes you look at your own life differently.. what kind of legacy will you leave? Will your lifes efforts be covered in ivy and dust?? Quirkeboy you pretty much summed it up. These places hide so much with so many stories to tell, and sometimes (in your instance) they are able to give you an insight into yourself. Ming where did you dig up that evil photo above! I havent seen that photo in a long time. Its interesting to see which photos other people like. I QC'd that image above a long time ago! The picture was shown on Wood's Lot, and I thought it was really cool and mysterious. And I didn't find it again when I actually browsed through the pictures on your site. Heheh, yeah, pictures and words travel in strange and unexpected ways. I was looking evhyrweere and this popped up like nothing!